When I inventoried my seeds last winter I discovered that I had plenty of seed for three of my favorite varieties. However the seeds were purchased for planting in 2015. They were 3 years old and most sources say that pepper seed is viable for only 2 years. I decided to test this old seed, noting the germination rate and plant vigor. My old seed would be compared to two ‘new to me’ varieties purchased this year, and to seed from last year. 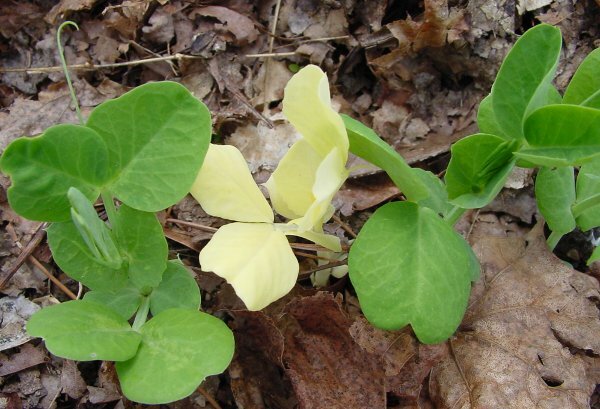 I also had a backup plan if none of the old seed grew – two of the varieties are available locally as transplants. Carmen – Italian “bull’s horn” (corno di toro) type, Johnnys Selected Seeds (JSS) 2015. Highlander – a mild Anaheim type pepper, JSS 2015. I’ve been growing my own transplants for decades. I know that two-year old pepper seed takes several days longer to germinate than fresh seed. For this test I decided to stagger the planting times to compensate for the slower germination of the old seed. My goal was to have similarly sized transplants at planting time. The 2015 seed was planted 3/25, the 2016 seed was started a week later on 4/1, and the new seeds were sown 4/7. My three-year old pepper seed did germinate, at rates ranging form 58% to 82%. The number of strong plants (as a % of the number of seeds sown) was considerably lower at 33%-73%. However I planted enough seeds that even a low percentage resulted in plenty of usable plants. 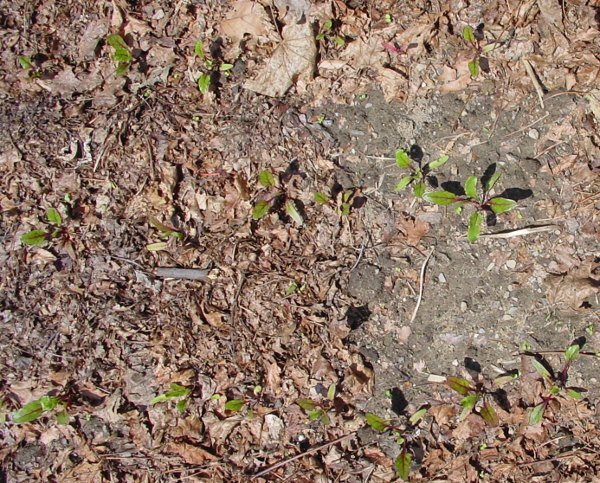 4/10 – Highlander, Intruder and Carmen are germinating. All were planted 3/25. 4/23 Highlander, Intruder and Carmen. Some plants are stronger, some are clearly less vigorous. I believe in planting a vegetable garden gradually. 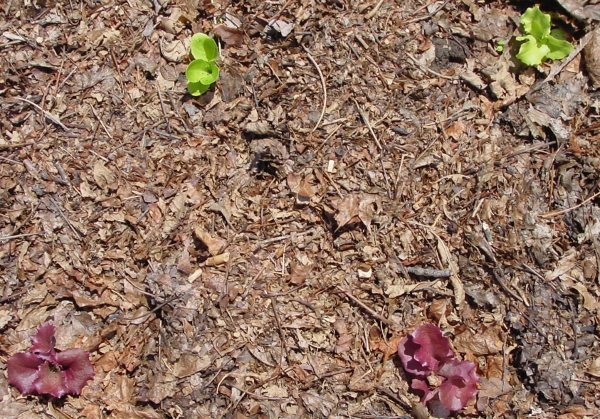 Some vegetables enjoy cold weather while others thrive in the heat. The gardener is happiest if the vegetables are planted when they are happiest. Here are the cold loving crops in my home garden – planted gradually, starting as soon as the soil was workable. I gave the soil a few days to dry after the snow melted then started planting. 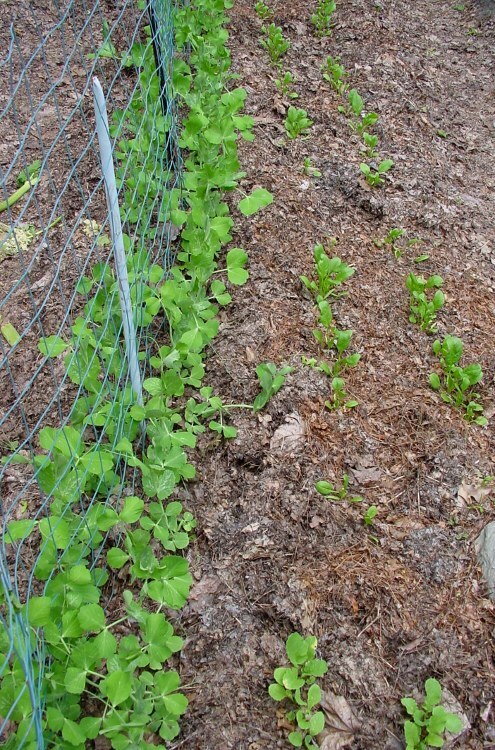 Snow Peas planted 4/2: ‘Oregon Sugar Pod II’ (right) and ‘Mammoth Melting Sugar’ (left end) and kale transplanted out 4/22. 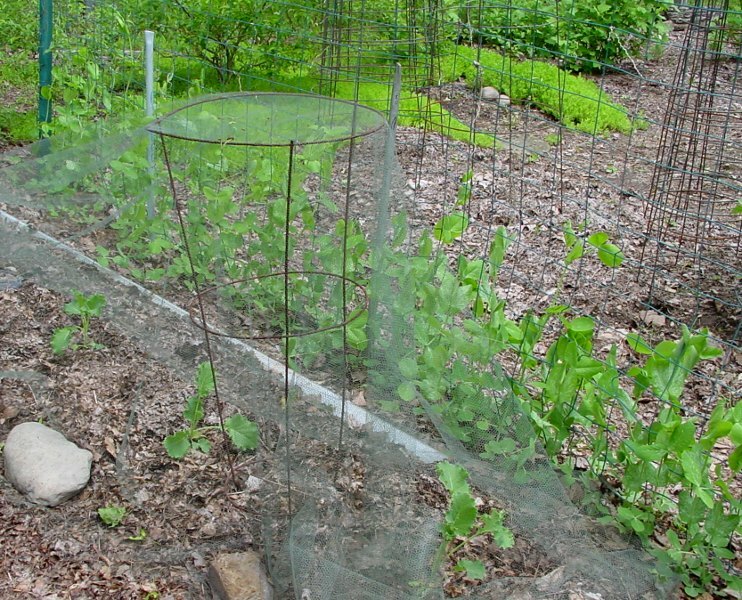 Thanks to Daphne for her post reminding me that tulle netting will work for most pests. I’m protecting the kale from Imported Cabbage worms (the adult is a butterfly) and Cabbage Maggots (the adult is a fly). It should work for both. I supported the netting with two small tomato cages because tulle is rough and I was afraid it would abrade the plants if it rubbed the leaves. Cascadia Snap Peas planted 4/8 and Tyee Spinach and a few radishes planted 4/9. Unfortunately the Norway maples to the south leafed out in early May so the garden is now part shade and plant growth has slowed. The lettuce is small but I’ve harvested a few leaves already. Cabbages ‘Mammoth Red’ and ‘Early Jersey Wakefield’ and Kohlrabi ‘Kolibri’, all transplanted 5/2. 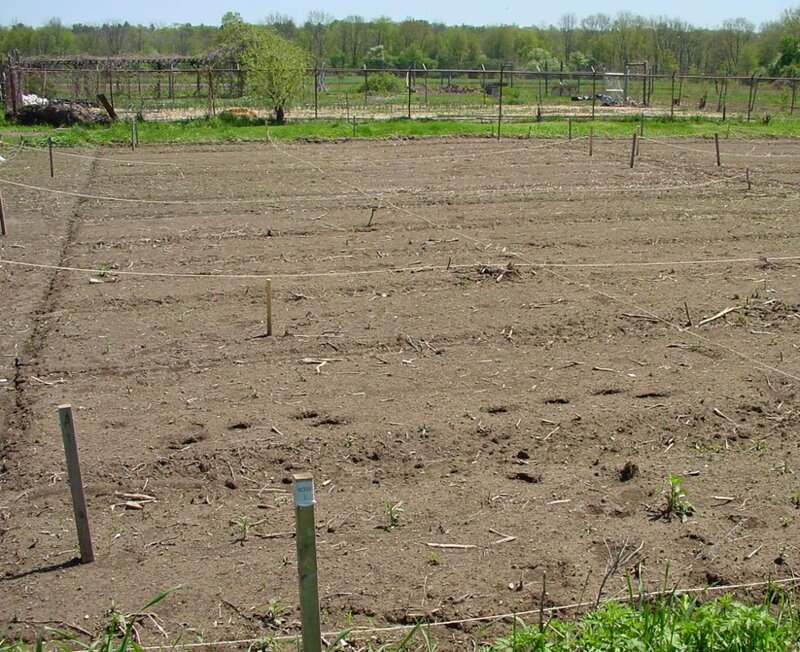 My other garden is two plots (total 20’x40′) at the Vassar Farm community gardens. Normally I alternate planting the two gardens, but not this year. In mid-March I stopped by the Farm. There was still 6-12″ of snow blanketing the gardens and I knew then that plowing would be late. Snow melt was followed by rain and the plowing didn’t finish until 4/22. Usually I’ve planted by that date. I paid my plot rent and volunteered to help mark the plots. Finally on 5/5 they asked for help to finish marking. Marking had started the previous Friday but was so wrong that another gardener and I along with 2 Vassar employees remeasured and marked the entire garden – about 120 plots. We finished around 2:30 p.m. and I could finally start my VF garden. A few VF community garden plots after marking but before planting. There are 4 plots going across and 20 rows of plots stretching to the right plus another section completely out of view. 5/5 Late afternoon – measure, mark and rake garden paths; evening – return with husband and post hole digger to place fence posts. 5/6 Morning – direct sow three varieties of spinach seed; afternoon – return with husband to staple up my fence of deer netting and chicken wire; evening – bury 15′ of fence and transplant chard and beets. Also transplanted ‘early’ lettuce and direct sowed radishes. 5/7 Bury another 30′ of fence bottom, transplant 93 Cortland onions, transplant 12 kohlrabi and direct sow 13′ of the original Sugar Snap peas. 5/8 Transplant 94 Cabernet onions. 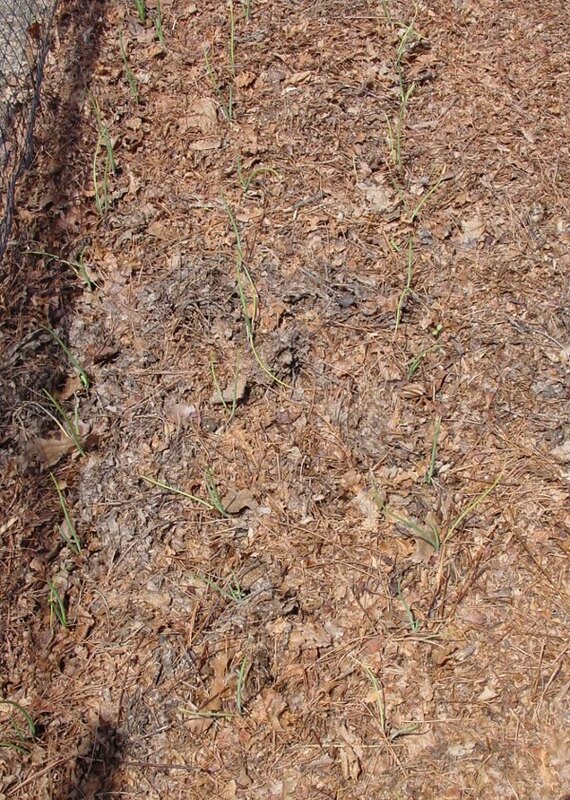 Fertilize and mulch all onions. Rain threatening. 5/9 day off – raining. Should be good for all the seeds. 5/10 rain stopped early. Transplanted some Asian greens and my ‘late’ lettuce plants. The late lettuce was supposed to be transplanted 3-4 weeks after the early lettuce, not 4 days later. 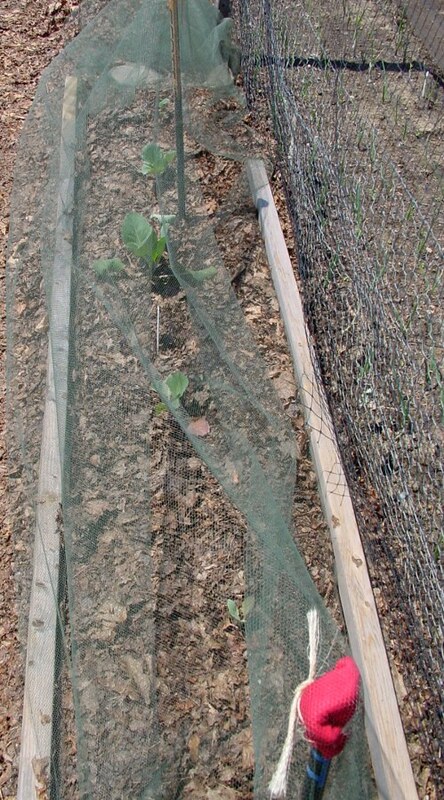 5/11 Bury 30′ of fence, transplant broccoli and cabbages. Transplant celeriac. 5/13 trench, plant the rest of potatoes, back-fill, mulch bed. Transplant bunching onions then direct sow three 4′ rows of Yaya carrots. Rain predicted for the rest of the week – should get the carrots off to a good start. 5/14 mulch. The backlog of planting is finished! 5/15 – 5/16 drizzle then rain. Not as much as predicted but a good amount – 1.2″. Sell vegetables in the drizzle at the Master Gardener Plant sale, our main fund-raising event. I start most of my plants from seed under a fluorescent fixture in the basement. I don’t have much space under the lights so the pots are tiny and I time sowing to move plants into the garden while fairly small. The onions and early lettuce spent an extra 3 weeks in the pots but they grew very little during that extra time. I’m hoping they are not permanently stunted. I never expected to accomplish this much in 9 calendar days. Here is what it looks like. Onions – so sad. They weren’t happy spending 3 extra weeks in the market packs. The onions don’t look like much now, but it usually takes about three weeks before they look happy. The lettuce has tripled in size though it is still tiny. 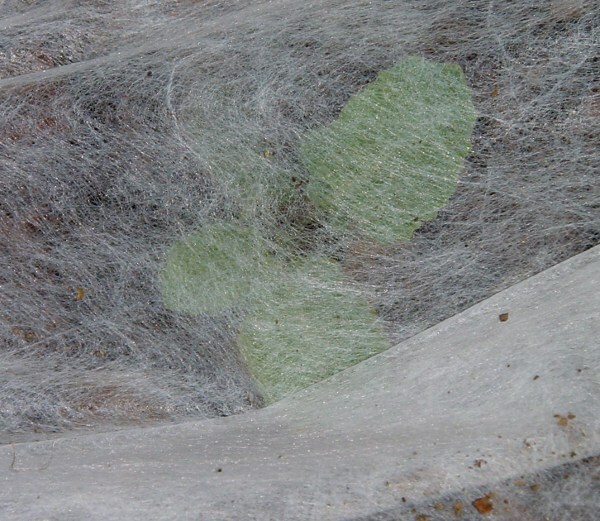 Broccoli protected by an Agribon floating row cover insect barrier. The cover is 8′ wide but extra width is tucked under a 2×4 behind the plants. Assorted cabbages protected by tulle. I’m worried about the broccoli and cabbages. I turn the soil with a garden fork before planting. (It’s been 2-3 weeks since plowing and weeds are growing.) I’m finding a lot of grubs in the turned soil, particularly in the areas closest to the grass where the Brassicas are planted. They look like the larvae of Japanese beetles or some closely related beetle. I killed every grub I found but I suspect I missed many. I wouldn’t want the adults to emerge under my row covers. The radish, pea, and spinach seeds sprouted rapidly. Radishes and spinach are showing their first true leaves and have also been discovered by the flea beetles. I’m still waiting for carrot sprouts, but they were planted only 6 days ago and needed the rain that didn’t fall. The sugar snap peas will be trellised as soon as I bring over the post hole digger. Cornell says that later planted peas often catch up with earlier plantings because they grow so fast in the warmth. I’ll compare the start of this year’s harvest to the last two years to see how true that is. This strange yellow pea plant is in the sugar snap row. It seems to be growing fine despite its weird color. And I have harvested this week: 2# rhubarb made into rhubarb bread, an overwintered leek put on our home-made pizza, spinach leaves from the 7 plants that overwintered under our 2′ of snow and garlic & common chives for scrambles eggs. 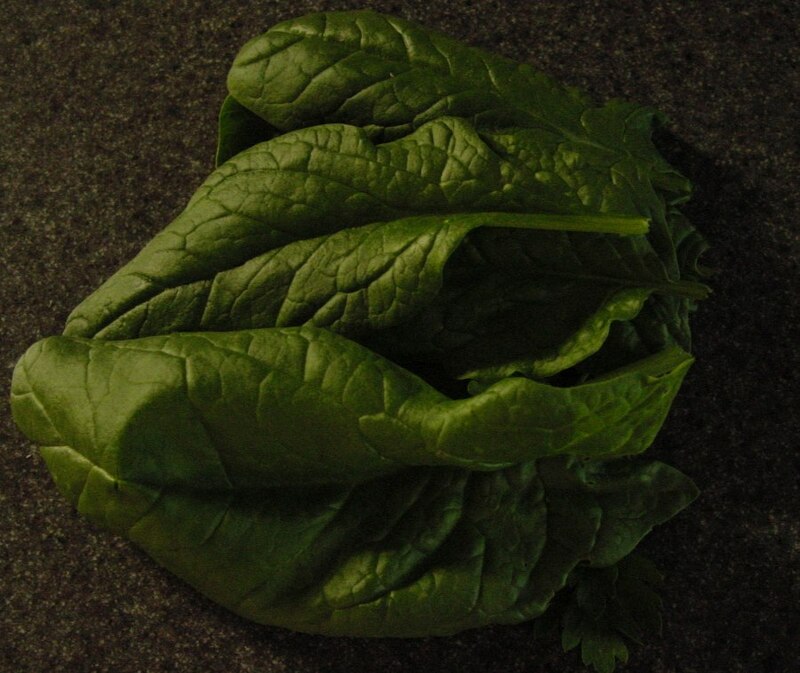 Spinach – looking very moody.